"Fran Dando is so scared of bananas that all it needs is a glimpse of one to make her shake, sweat profusely and even vomit. 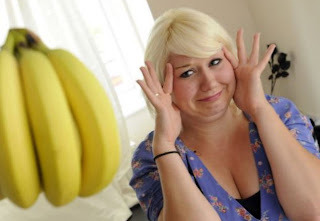 The 21-year-old children’s worker suffers from bananaphobia, an overwhelming fear of the yellow fruit. ‘It began when I was seven and my brother put a banana in my bed as a joke,’ said Ms Dando, from Hastings, East Sussex. She has since been forced to dodge bananas in shops and turn a blind eye to them in the fruit bowl at friend’s houses. However, Ms Dando’s two-year-old son, Harrison, loves bananas, which has put her in a tricky situation. ‘I have to use a blanket to pick them up and put them in the trolley and then when I am at home I have to wear rubber gloves and use a tea towel to open one and give it to him,’ she said." things I saw that made me wonder.